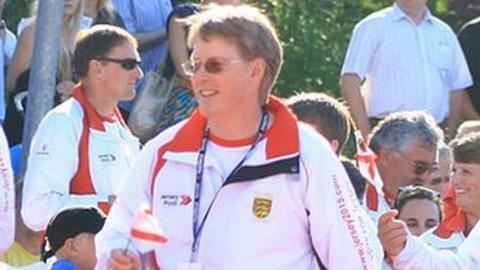 Jersey's team manager at the 2015 Island Games, Jeff Reed, says the island should top the medals table at their home Games next summer. Reed has been appointed as general team manager for the fourth time having held the role in 2005, 2007 and 2009. "I'd be very disappointed if Jersey isn't top of the medals table," Reed, who is in charge of his island's competing athletes, told BBC Sport. "We've all got to aim for that and that's our aspiration." "Hopefully we can build on from the Olympics and Commonwealth Games when you've got that spectator enthusiasm and the competitors rise to the occasion. "I think home advantage will play a big part; look at the London Olympics and what Team GB achieved. "I'd like to think the people of Jersey will get behind the team and spur them on to bigger and better things." Jersey topped the medals table when they last hosted the Games in 1997: winning 75 gold medals, 53 more than second-placed Isle of Wight. Reed's first Games as general team manager were in Shetland in 2005, when he stepped in at 10 days' notice after Gary Jones was taken ill. It was a role that he continued in subsequent games in Rhodes and Aland before work commitments prevented him from carrying on in the Isle of Wight in 2011 and in Bermuda two years later. "Once you've got the Island Games in your blood it never goes and as soon as I could free up the time I wanted to do it. "If everything's going OK, when you look at Shetland, it was so well organised and everything fitted into place, it becomes very easy and you can see lots of sports. "If there's issues with some of the organisation them you become a real problem-solver and we had to work really hard in Rhodes sorting a lot of things out. "But at the end of the day once you've got the team there you become the number one cheerleader." And Reed says working on a home Games will present different challenges to what he has faced before. "This one is going to be interesting because every other Games I've been involved in have involved accommodation, transport and building up team spirit. "There is a danger we'll struggle with that as we won't be altogether in one place as I assume everyone, once they compete, will head off home again."